Easter greetings. I have many experiences to write about. So much has happened in the 11 days that I have been in Indonesia, it is difficult to keep up with writing and sharing it all. Good Friday and Easter are special here in Sumatra, and I learned a lot about the customs and culture of the Batak people. Good Friday is a holiday for all of the country, even though it is a Christian celebration. Here in Sumatra, singing is a big part of the Batak people’s culture. In their churches, they go to Good Friday service in the morning, sing a lot of hymns in beautiful harmony, hear a sermon, and the entire life of Jesus is read. There is a break in the afternoon for lunch. Then in the afternoon, Holy Communion. 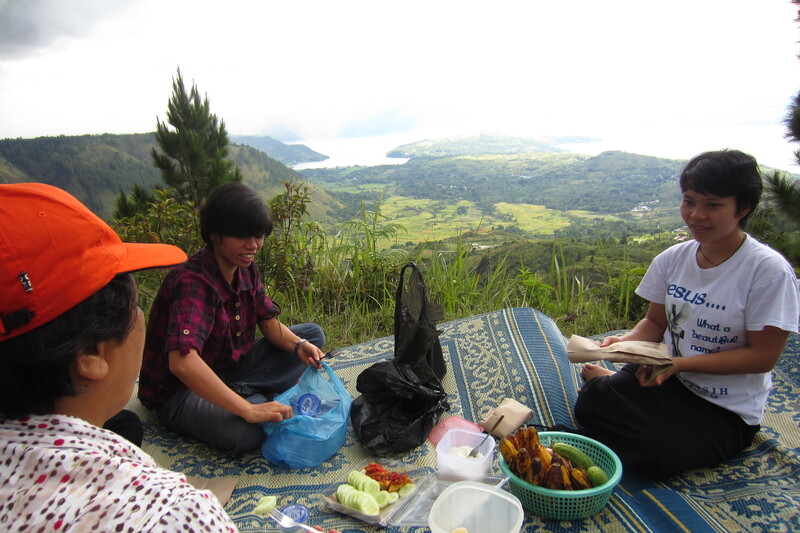 I attended a much shorter worship at the nearby hospital, then went out for a picnic at a spot with a scenic view of Lake Toba. Before we left for our picnic, I heard the voices echoing from the nearby HKBP church. Then, softly in the background, I heard the chant of the muezzin singing the Muslim call to prayer. Balige is mostly Christian, but there are some Muslims here. It was a reminder of the many cultures and faiths here in Indonesia. After a ride on narrow, windy, and sometimes broken roads (with a slight scenic wrong-turn detour), we found our picnic spot. And what a sight! With a blanket laid out, we began to eat our fried noodles against the panoramic backdrop of lush green mountains, deep valleys and the blue of Lake Toba. Five minutes later, however, the nearby mountains disappeared under a gray band of rain shower, forcing us to finish our meal in the car. Nunga hehe Kristus i, Haleluya! These were the words I heard and spoke on Easter morning. I experienced the Batak church at 5am. This early service was the important one for the day. 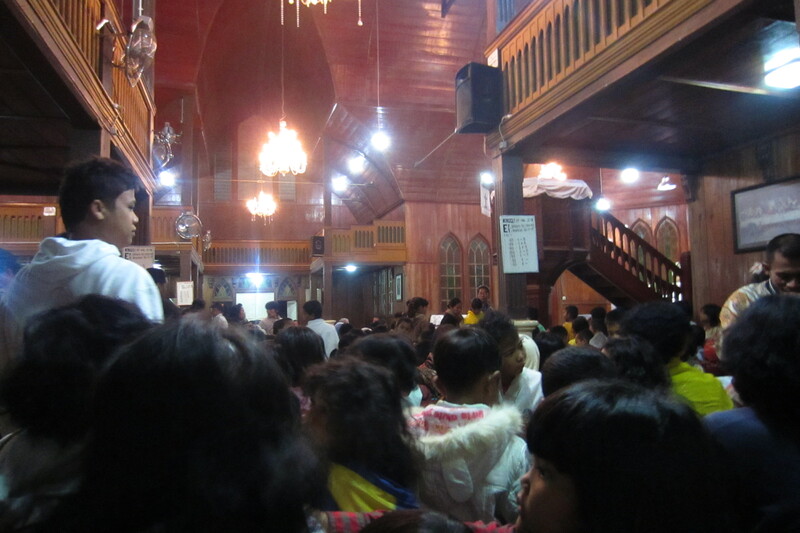 The church was packed full of people, including many children. We sang hymns, heard Scripture and a sermon. Then after worship, the kids received boiled eggs dyed in bright colors and a special cake made of coconut, rice, and sugar wrapped in a banana leaf. Everyone also got coffee or tea. At the school the students had fun searching for hidden eggs before the sunrise. Later in the morning after breakfast, I went with a few others to Lake Toba for the rest of the Easter holiday. 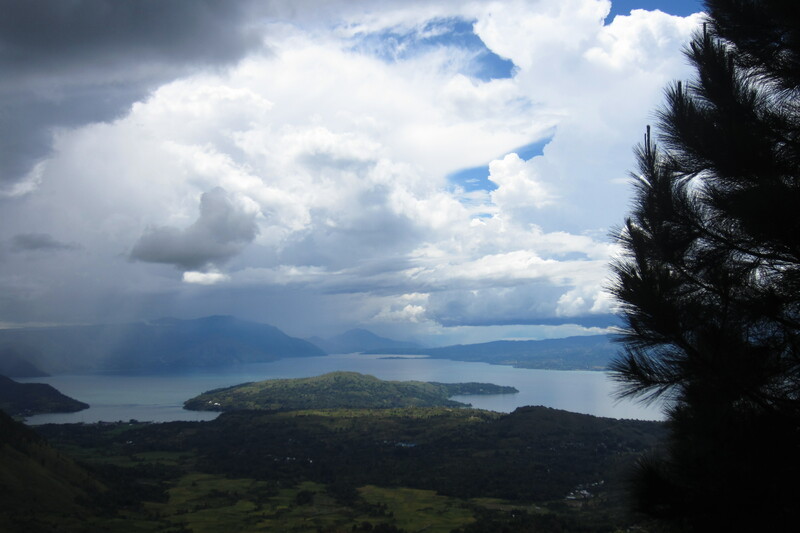 Stay tuned for another post about my experience of Lake Toba, Samosir Island, and Batak family culture.